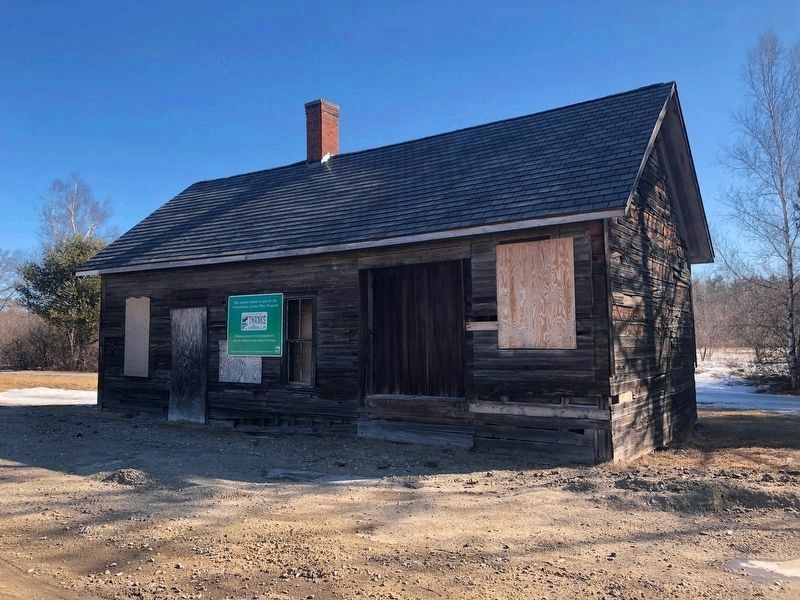 Constructed in 1855 to replace the original station, this is the oldest surviving depot on the former Northern Railroad. 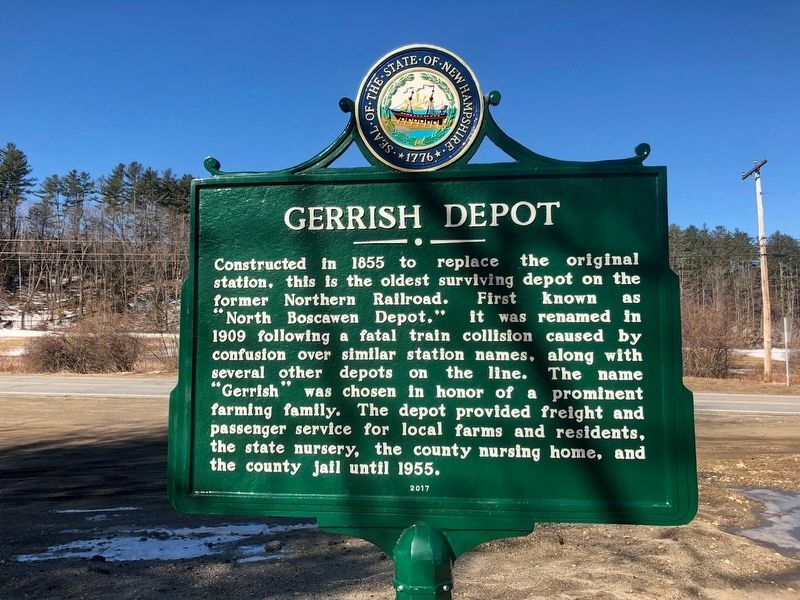 First known as "North Boscawen Depot,” it was renamed in 1909 following a fatal train collision caused by confusion over similar station names, along with several other depots on the line. The name "Gerrish” was chosen in honor of a prominent farming family. The depot provided freight and passenger service for local farms and residents, the state nursery, the county nursing home, and the county jatl until 1955.
parking area used by recreational enthusiasts accessing the Northern Rail Trail. 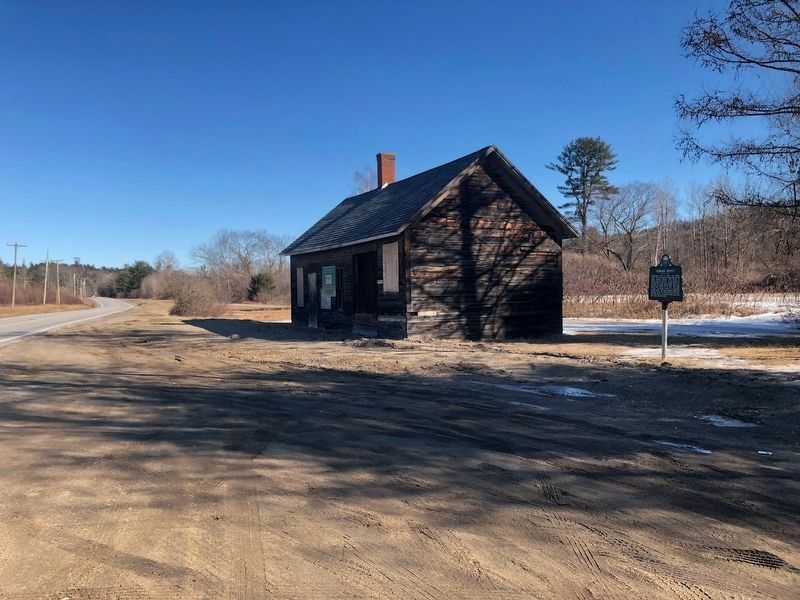 Marker is in this post office area: Concord NH 03303, United States of America. Touch for directions. Other nearby markers. At least 8 other markers are within 5 miles of this marker, measured as the crow flies. Air Force History in New Hampshire (approx. 2.2 miles away); Birthplace of Hon. Moody Currier (approx. 3.7 miles away); The Webster Homestead (approx. 3.8 miles away); Birthplace of Gen. John A. Dix (approx. 4 miles away); Daniel Webster's First Law Office (approx. 4 miles away); Birthplace of Daniel Webster (approx. 4.1 miles away); Site Of First Fort A.D. 1739 (approx. 4.2 miles away); Birthplace of William Pitt Fessenden (approx. 4.3 miles away). Touch for a list and map of all markers in Boscawen. More about this marker. 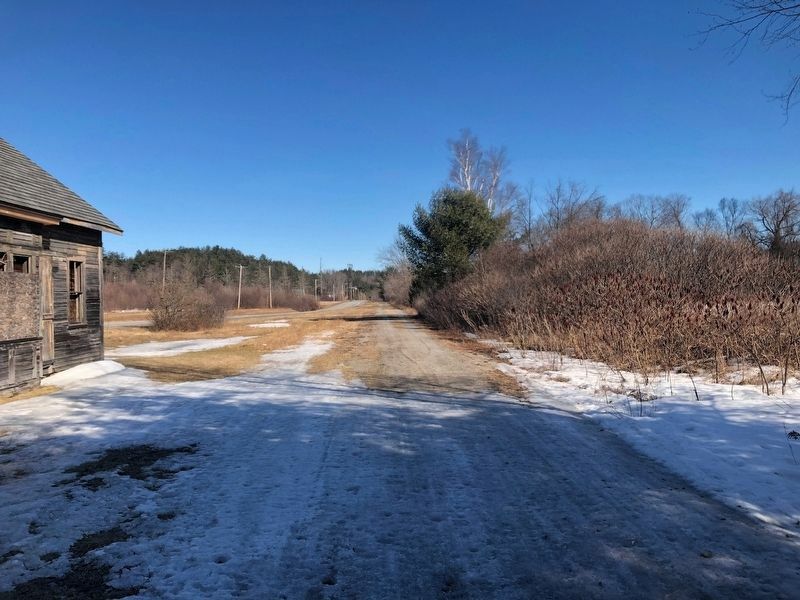 The railroad right-of-way for the Gerrish Depot is now part of the Northern Rail Trail, a 57+ mile long recreational trail stretching from Boscawen to Lebanon, New Hampshire (see link). More. Search the internet for Gerrish Depot. Credits. This page was last revised on March 26, 2019. 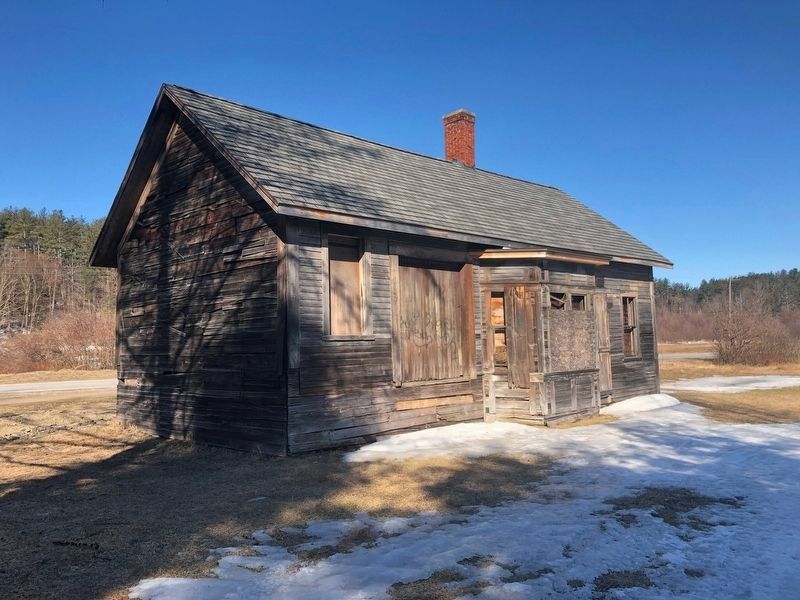 This page originally submitted on March 25, 2019, by Douglas Finney of Concord, New Hampshire, USA. This page has been viewed 37 times since then. 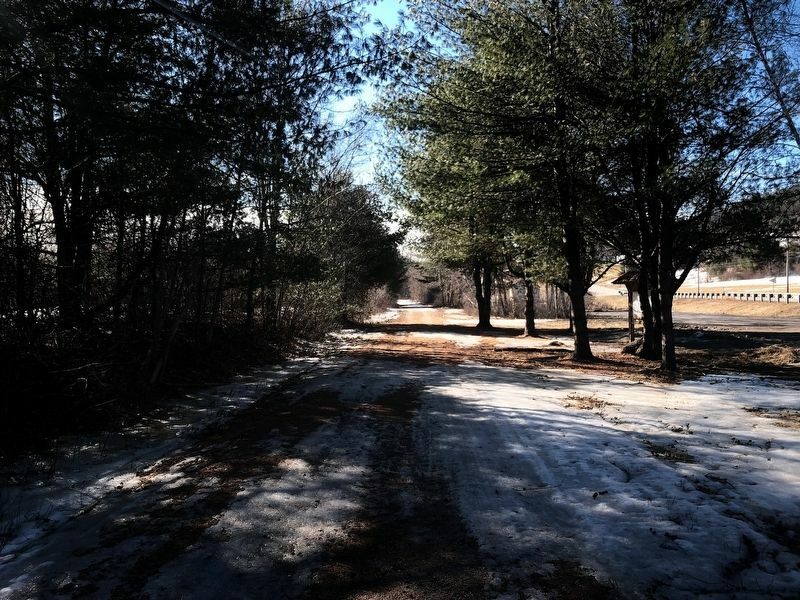 Photos: 1, 2, 3, 4, 5, 6. submitted on March 25, 2019, by Douglas Finney of Concord, New Hampshire, USA. • Bill Pfingsten was the editor who published this page.